There hasn't been a lot of blogging going on recently. Once again, it's because the ME is bad and most things are a struggle, and unfortunately blogging goes down the bottom of the to do list. 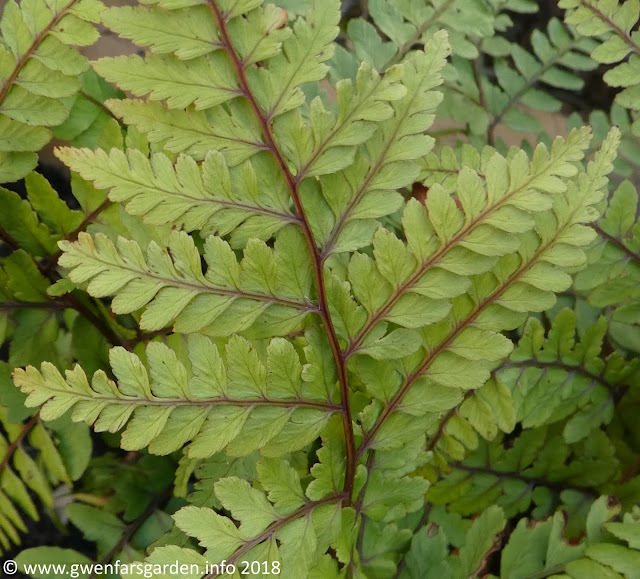 However, I have managed to take some short wanders around the garden, and I'm particularly enjoying this fern, Athyrium otophorum var. okanum. It's deciduous, although hasn't show much sign of dying off even though it's late Autumn. It's a clumping variety with it's leaves gently arching. It doesn't like direct sun, and I've planted mine in the shadiest part of the Wisteria border, next to the beech hedge. I love the patterns within the leaves, and the reddish-purple ribs from which the leaves arch out. I'm not giving up on blogging, but the frequency will probably continue to be reduced for a while. That doesn't mean I forget about gardening and plants. Never! 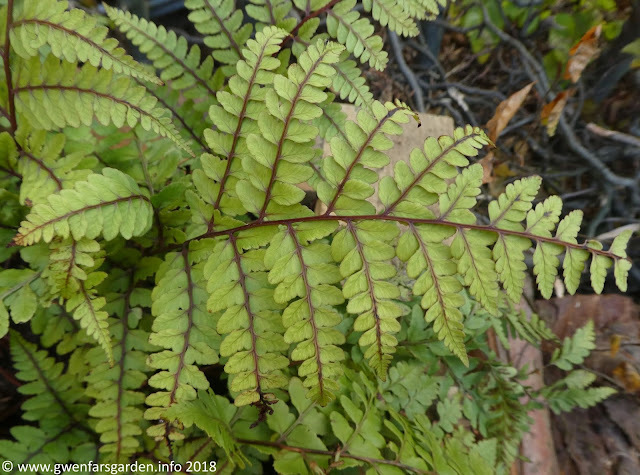 It's just a case of very careful priorities, and I'd rather spend 5 minutes in the garden than 30 minutes blogging (a short post like this takes me that long these days). 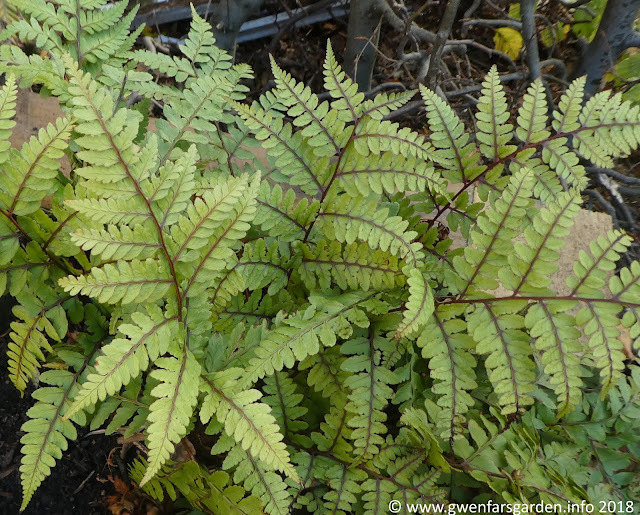 Enjoy this delightful fern, and I hope you are all well and happy in your gardens. We have the same variety, I love it. Lovely fern. Blogging isn't as important as your health, take care of yourself. Your post popped up when I was searching for growing details of this fern. Your pictures show of the colour and structure beautifully. Today when I was pottering round the garden, I found that it had gone into its winter mode...curled up dried leaves. I first acquired it in 2015: https://noellemace.blogspot.com/2015/08/new-plants.html, and its about time I potted it into a larger pot. I have very little shade in my new garden, until planting matures. Oh wow, I'm glad it showed up so quickly and that you liked the photos. I'm guessing with the wet and windy weather we are now getting, mine will go into winter mode soon too. I'll go and visit your post now.